Employee share ownership starts with one share held by one employee and it can go to 100%. It can be through shares or through membership (for instance in workers' cooperatives). It can be direct or indirect, through dedicated legal vehicles, as it is the case for any other investors. Even when looking at largest companies, it is remarkable that all situations exist, from 0 to 100%. 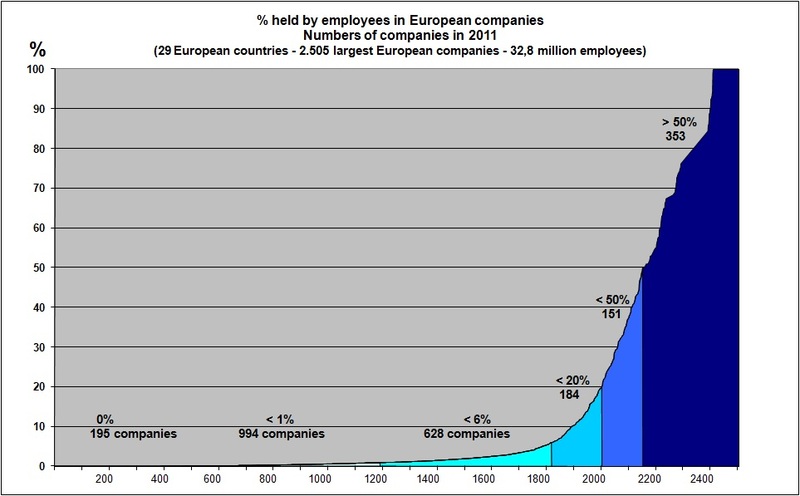 The following graph gives the picture of all 2.500 largest European companies, by order of employee share ownership rate, from 0 to 100%. You don't see any fetish number appearing: 51%? 25%?... - No steps, it is a continuum. Up to 1% employee share ownership appears to be insignificant or embryonic, over 1% it is becoming significant, over 6% it is strategic, over 20% it is determining, and over 50% it is controlling. EFES' objective is to act as the umbrella organization of employee owners, companies and all persons, trade unions, experts, researchers, institutions looking to promote employee share ownership and participation in Europe.